Nawah Energy Company (Nawah), the operator of the Barakah Nuclear Energy Plant in the Al Dhafra Region of Abu Dhabi, has become the first company in the world to develop English language standards for nuclear plant operations. A subsidiary of the Emirates Nuclear Energy Corporation (Enec) and partially owned by the Korea Electric Power Corporation (Kepco), Nawah said these standards play a significant role in ensuring a high level of effective safety communication as part of a healthy nuclear safety culture. With employees from more than 40 nationalities, Nawah is the most multinational and multicultural nuclear operating company in the world, according to Nawah. Ensuring that the operators and maintenance personnel meet the highest standards of communication has a direct positive impact on the sustainable and reliable operation of the four units at the Barakah plant, it stated. Nawah CEO Mark Reddemann said: "As we prepare to begin operating the first nuclear energy reactor in the Arab World, everyone at Nawah has been working to maintain high standards of effective safety communications." "With the development of the first ‘Nuclear English’ standards, we can now ensure that our staff have the language ability to effectively communicate, to support safe, reliable operations," he added. Reddemann said Nawah's current focus was to finalise the assessment of the people essential to the Fuel Load and start-up of Barakah Unit 1, comprising operators, maintenance and security personnel, emergency response officers, as well as other groups. "Our dedicated Organizational Effectiveness team is working around the clock to ensure that these people sit the exams and obtain the official certification needed to meet the Nuclear English standard," he stated. "So far, we have evaluated about 90 per cent of the staff and around 55 per cent have already achieved the required level," he added. As part of the implementation of the Nuclear English standards, and to facilitate continuous learning, Nawah has created the world’s first Nuclear English Development Center (NEDC) at the Barakah plant. "Effective safety communication at a nuclear plant is not about English native- and non-native speakers; it is about a group of people from around the world working together as a team, being able to adapt to changing situations, and using the same terminology to support the long-term safe and sustainable operation of the nuclear energy reactors they are working on," said Reddemann. "In fact, Peter Dietrich, Nawah’s chief nuclear officer who is from the US, recently took the Nuclear English Test as this is a requirement," he remarked. 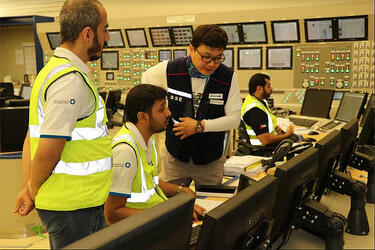 The ‘Nuclear English’ standards developed by Nawah are based on the International Civil Aviation Organization (ICAO). The Nuclear English test uses a similar format to the Test of English for Aviation, but is set within the nuclear context and is developed in consultation with nuclear operators.